Climate sensitivity and aerosol forcing are dominant uncertain properties of the global climate system. Their estimates based on the inverse approach are interdependent as historical temperature records constrain possible combinations. Nevertheless, many literature projections of future climate are based on the probability density of climate sensitivity and an independent aerosol forcing without considering the interdependency of such estimates. Here we investigate how large such parameter interdependency affects the range of future warming in two distinct settings: one following the A1B emission scenario till the year 2100 and the other assuming a shutdown of all greenhouse gas and aerosol emissions in the year 2020. We demonstrate that the range of projected warming decreases in the former case, but considerably broadens in the latter case, if the correlation between climate sensitivity and aerosol forcing is taken into account. 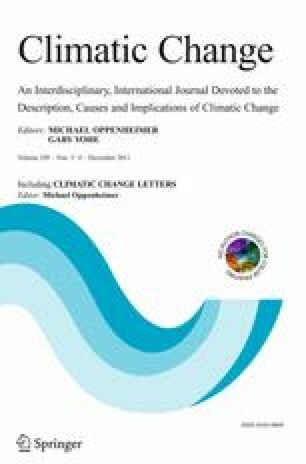 Our conceptual study suggests that, unless the interdependency between the climate sensitivity and aerosol forcing estimates is properly considered, one could underestimate a risk involving the “climate trap”, an unpalatable situation with a high climate sensitivity in which a very drastic mitigation may counter-intuitively accelerate the warming by unmasking the hidden warming due to aerosols. Comments by Kyle Armour, Terje Berntsen, Andreas Chlond, Reto Knutti, Nathan Rive, and several anonymous reviewers at various stages are very useful to refine the paper. K. Tanaka is supported by the IIASA Postdoctoral Fellowship, the Norwegian Research Council under project 184840/S30 (CLIMSENS—Constraining total feedback of the climate system by observations and models), and the Marie Curie Intra-European Fellowship within the 7th European Community Framework Programme (Proposal N° 255568 under FP7-PEOPLE-2009-IEF).